Recently some more games were added to my bumpy ride with this opening. It started last year in the Malmö GP. There I played against a 2200+ player. Things went from bad to worse and finally to completely hopeless. The time control was 50 minutes per player for the whole game. My only hope was to trick this guy somewhere when time trouble would set in. His heavy Swedish accent sounded very funny! The angry Viking didn’t wait for my reaction and went away with his tale between his legs. In two other classic games (in other competitions) I faced similar problems. But in some way or another I managed to extract a win and a draw out of these two games. So what is the problem? If black plays 3. – d5 we will have a Catalan on the board. I like that a lot because it usually gives white a slight but lasting plus. Steering the play into the Benoni waters has some advantages for black. The white setup is not the most challenging against the Benoni. White’s development is a bit slow and one might ask the question ‘what is the bishop doing on g2?’ Probably it will only reach it’s full potential if white is able to break through in the center. In the meantime black gets very active play. Another possibility is to leave the pawn on d4 an play 4. Nf3 black can take on d4 and we get a completely different game. This is certainly not the only move for black. In the setups that normally lead to the Benoni white has a knight on c3, so b5 isn’t a great move. But here it is possible of course. 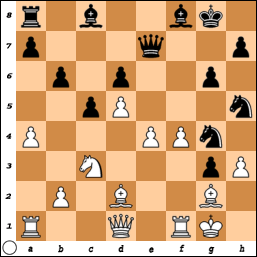 Boris Avrukh calls this the Catalan Benoni ‘because it almost always arises via the 3. g3 move order’. Another possibility is to enter the snake Benoni with 5. – Bd6. Snake because of the intended maneuver Bf8-d6-c7-a5. It seems to me a bit time consuming. Black has several other moves here, for instance: A) 9. -Bg4 B) 9. – b6 C) 9. -Na6 or D) 9. – a6 White answers a6 always with a4. This is the most active plan for white. Avrukh calls this a semi waiting move. In most of the cases white has to play a4 sooner or later, so why not play it at this moment and wait a moment to see how black is going to deploy his forces. This move has only been played in two other games. So it is not a novelty, but let’s say close to it? Other ideas are: 11. – Nh5 12. Bg5 f6 13. Bd2 f5 14. Ng5 with a better game for white. Black can also choose for 11. – Ng4 12. Bg5 f6 13. Bd2 a6 14. Rb1 Nge5 15. b4 cxb4 16. Rxb4 Nxf3+ 17. exf3! f5 18. a5 Dd8 19. Qa4 Nc5 20. Qa3 and white went on to win in Avrukh-Eljanov (2012). This is the move I also played in my games. It is aimed against the maneuver Nf6-g4-e6. But is a bit passive and weakens the protection of white’s king. 12. Nb5 Ne8 13. Qd2 Bb7 14. e4 looks to be more active. My patzer inclination is to take immediately on f8 and don’t wait. Komodo agrees with me: 17. Nxf8 gxf2+ 18. Rxf2 Nxf8 19. Qc2 White still suffers from various weaknesses, but his pieces are more active compared to the game. We reached the diagram position. To take or not to take? That’s the question! Although I realize the practical chances are on black’s side, I would accept the present. In fact there are no other good moves. But maybe the position is easier to defend after 20. Qe2 black might play Bg7 21. e5 Nf2 22. Rxf2 gxf2 23. Qxf2 Bb7 (23. – dxer?? 24. d6 Qxd6 25. fxe5 Bxe5+-) 24. Re1 Rf8 25. Qe2 and black is better, but the threats seem to be less nasty. Komodo comes with 22. Ra3. This is a move I would not think about. I guess it is all too human to want to run away as vast as possible with the king. Probably the decisive mistake. But who can blame white? The pressure was increasing. Better is 23. Ra3 Qh2 24. Ne2 Bxb2 25. Rab3 Bg7 26. Qc2 = This reminds me of the positions I had in my games. It looks bad for white. On the plus side: I did not only survive, but won the game somehow. By the way: my dear friend Komodo is not so pessimistic about white’s chances. He thinks it is about equal. Another truth is of course: would it have been a game between Hoetmer and Ponomarov, the poor Ukrainian would have been dead lost. I tend to win these kind of games from worse positions (just kidding). And white resigned. Coming back to the key question: was it wise to accept the sacrifice? We might answer with another question: did you see a better solution?